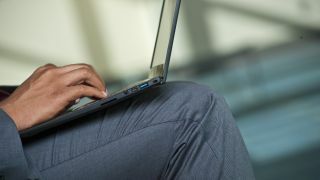 Laptops have been evolving since first going on sale in the 70s, culminating in today's thin and light Ultrabook models. Manufacturers have made improvements in just about every possible way, but can any of them really claim to have innovated in the one area that for many is integral to productivity: the keyboard? The answer is no. Until now. Step up the pioneering ThinkPad X1 Carbon - Lenovo's slimmest, lightest and most durable business Ultrabook yet. At first glance, it serves up a typically attractive and functional ThinkPad keyboard with curved, well-spaced, chiclet-style keys. Lenovo has clearly been careful not to tinker with the classic and functional design introduced by IBM in the 90s. Look closer, however, and you'll find an added layer of intelligence, the kind of which you won't find on any Apple MacBook, Toshiba Satellite or Dell Ultrabook. In fact, you won't find anything like it in any other competing model. That intelligence is embedded in a first-of-its-kind strip of capacitive, touch-sensitive function keys located above the keyboard that can be found in what Lenovo calls an 'Adaptive Function Row'. Located where you'd find the usual row of function keys above the keyboard, it offers almost twice the number of functions of the original ThinkPad X1 Carbon and automatically changes based on the software or application being used so that the most relevant keys are highlighted. This is advantageous because many programs don't make the most of the standard function keys found at the top of standard keyboards. Most of the time these keys usually perform the same basic, seldom-performed tasks, such as opening a help menu or maximising a window - things that can usually be done by clicking within menus or toolbars. What if you could finally put those function keys to good use by programming them to perform common functions associated with your favourite applications? With the ThinkPad X1 Carbon's compelling Adaptive Function Row, you can. The touch-sensitive keys, which light up to help you see what you're pressing in low-light conditions, operate in five different modes and automatically switches to the most appropriate one depending on what you're doing. The mode that performs actions the closest to a regular keyboard is Function Mode, which provides the standard F1 to F12 keys, in addition to controlling airplane mode, turning projector support on or off and controlling keyboard backlighting. Standard mode allows you to adjust volume, brightness, use search, Alt+Tab to switch between apps, and activate a snipping tool for taking screenshots, in addition to a dedicated option for opening cloud storage accounts. A Horizontal mode of keys makes it easier for when you're working with the ThinkPad X1 Carbon's 2560x1440 HD display that can fold back almost 180-degrees for sharing content with a friend. Designed to assist with web browsing, Browser mode lets you adjust volume, brightness, move back and forward between web pages, snip content and activate voice and gesture controls. Finally, those who attend regular online meetings will be glad to find a Conference Mode, which provides a means to control volume, brightness, microphone volume, the ability to mute different conference participants, switch the webcam off and on, cycle through camera modes and activate voice and gesture control. The order of modes can be adjusted, and modes can be assigned to certain applications in a setting called dynamic mode. The most obvious benefit to having such a row of keys is clearly convenience, but speed is a real gain too. Need to quickly take a screenshot of a window? No problem, just give the relevant lit key a tap. What if you're then called into a Skype conversation and you want to turn off your webcam to communicate using typed messages? Simply tap the appropriate key to switch off your webcam that lit up when Skype opened. On the ThinkPad X1 Carbon, it's that simple. There's certainly plenty of combinations of applications and function key settings, meaning there are time savings and productivity gains to be had that you won't even be aware of. Whether you have the time to find them all is another matter, but you'll be safe in the knowledge that you won't be adapting to survive: you'll be adapting to thrive.